Kerr Gibb a’ toirt dhuinn ro-shealladh air na rèisean rothaireachd a tha romhainn an ràith seo. Air an 20mh latha den Ghiblean, 1980, air latha garbh fuar sa Bheilg, cha robh sgeul fhathast air an earrach agus an rèis chliùiteach Liège-Bastogne-Liège a’ gabhail àite. Às dèidh 70km a-mhàin den 245km bha dà thrian den 174 daoine a thòisich air tarraing a-mach. Bha an sneachd agus a’ ghaoth air cùisean a dhèanamh cho doirbh is nach robh cinnt aig an luchd-stiùiridh an ruigeadh duine sam bith Liège. 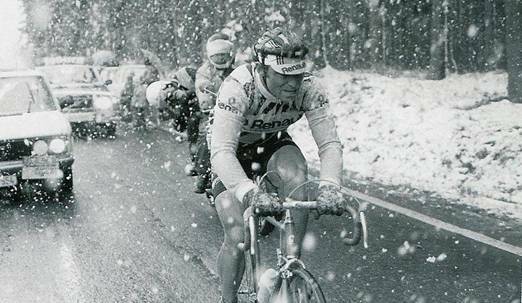 Le 80km air fhàgail chaidh am buidheann gruamach a bha air a bhith air thoiseach a ghlacadh agus sheas Bernard Hinault air na casachain. Gun a bhith mothachadh sa chiad dol a-mach, dh’ fhàg e càch air a chùlaibh. Bha Hinault air iomadh rèis a bhuannachadh roimhe, nam measg an Tour de France. An latha sin, an aghaidh na sìde agus gach beachd ciallach, bha e gus tè eile a chosnadh. Chrìochnaich e 9.24 mionaidean air thoiseach air an ath dhuine is cha do chuir ach aon duine air fhichead crìoch air an rèis. Bha am fuachd cho dona is gun tug e ùine mhòr dha e fhèin a bhlathachadh agus bha dragh air nach robh faireachdainn na dhà chorrag ach shaoil e gun tilleadh sin le ùine. Gu mì-fhortanach bha e ceàrr. Chaidh cron a dhèanamh air corragan Hinault leis an fhuachd an latha sin a mhaireadh fad a bheatha. ’S ann tron phailteas de sgeulachdan mar seo a tha daoine air an tàladh gu rèisean clasaigeach an Earraich, no na Spring Classics. Gach bliadhna tha aire an t-sluaigh air a ghlacadh gus an dèanamh a cheart cho dìleas ri geàm ball-coise sam bith ann an cuid de sgìrean na Roinn Eòrpa. Tha na far-ainmean a th’ air na rèisean nan comharra gur iad seo nan rèisean airidh air daoine cruaidhe, làidir, treun a dh’fheumas a bhith deònach droch shìde agus droch rathaidean nan clach-càsaidh – neo am pavé – fhulang. Bidh iad a’ gabhail àite tron Mhàrt agus a’ Ghiblean anns a’ Bheilg agus na sgìrean timcheall, bidh cuid eile san Eadailt. Tha iad eadar 200km is 300km de dh’fhaid agus a’ toirt a-staigh measgachadh de sheann rathaidean nan clach-càsaidh agus cnuic chas na Beilge a tha goirid ach cumhang agus sleamhainn ann an droch shìde. Anns an deich bliadhna a dh’fhalbh tha dithis gu sònraichte air soirbheachadh sna rèisean an Ronde Van Vlaanderen (‘Cuairt an Fhlannrais’) agus Paris-Roubaix aig a bheil eachdraidh còrr is ceud bliadhna a dh’aois. Anns an dà Dhòmhnaich ri thighinn thèid an t-Eilbheiseach Fabian Cancellara – no ‘Spartacus’ mar a th’ aca air – an aghaidh ‘Rìgh an Fhlannrais’ Tom Boonen anns na dearbh rèisean seo. Tha sia tiotalan eadar an dithis aca san Ronde, trì an urra, barrachd air duine sam bith eile. Mar sin bidh reacord sònraichte ri chosnadh Didòmhnaich ma bhios spionnadh no brosnachadh a bharrachd a dhìth idir. Tha fadachd gu h-àraidh air an luchd-amhairc ris na rèisean seo am-bliadhna leis gu bheil dà bhliadhna air a dhol seachad gun sealladh air na fuamhairean seo a’ strì an aghaidh a chèile gu ceart. Ann an 2012 ghlèidh Boonen an dà rèis às dèidh do Chancellara a dhol sìos le cnàimh an uga brìste sa Ronde. An-uiridh, chaidh cùisean an rathad eile gu tur às dèidh do thubaist a bhith aig Boonen sa Ronde chaill e a-mach air an rèis sin agus air Paris-Roubaix agus ghlèidh Cancellara an dà dhiubh. Ach tha na rèisean seo ainmeil airson a bhith doirbh an tomhais. Chan eil e idir cinnteach gur e Boonen no Cancellara a shoirbhicheas le iomadh neach eile comasach air a’ chuis a dhèanamh. Bidh sùil an luchd-amhairc gu h-àraid air an Slobhagianach òg Peter Sagan is e air a chumail suas mar oighre de sheòrsa sna rèisean seo airson bliadhna no dhà a-nis. Tha aige fhathast ri tè de na còig monuments a bhuannachadh agus saoilidh mi gur e deagh bhliadhna a bhiodh ann dha e fhèin a chur air adhart gus Cancellara is Boonen fhàgail air dheireadh. A dh’aindeoin mì-chinnt air cò bhuannaicheas, air dè thachras agus gu cudromach air dè an t-sìde a bhios ann, tha aon rud cinnteach; agus ’s e sin gum bidh pailteas dràma ann a chuireas tuilleadh sgeulachdan ris a’ bheul-aithris bheartach a tha a’ cuartachadh nan rèisean seo. Tha na rèisean clasaigeach uile beò air seanailean Eurosport agus ri lorg air loidhne, ’s fhiach an coimhead.